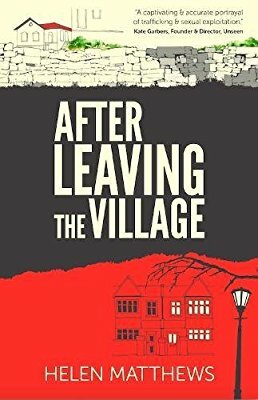 Today I have a review for you for the book After Leaving The Village by Helen Matthews. Helen and I are in the fabulous Fiction Cafe book group and she approached me asking if I could possibly read her book in exchange for a review. I always like to help out new authors and found I had time in my schedule. Two women. Two villages. Different destinies. Odeta’s life has shrunk to a daily round of drudgery, running her father’s grocery store in a remote Albanian village. One day a stranger from Tirana walks into the shop and promises her a new career in London. Odeta’s life is about to change, but not in the way she expected. Journalist Kate lives on a quiet London street and seems to have a perfect life but she worries about her son Ben, who struggles to make friends. Kate blames the internet and disconnects her family from the online world so they can get to know their neighbours. On a visit to her home village in Wales, Kate is forced to confront a secret from her past. But greater danger lies closer to home. Perhaps Kate’s neighbours are not the friendly community they seem. I am not sure what I expected when I read the blurb but it wasn’t what I got. I was glued to the book. The story follows two very different women and I couldn’t put it down. There are elements of a graphic nature but it isn’t written in a way that makes you want to put the book away. I really felt for Odette and I kept thinking how this must actually be a harsh reality for many women in the world today. I really felt hate for this who kept her that way. I liked Kate and I understand all to well what she was trying to achieve though I did think towards the later chapters she acted irrationally and put herself in unneccessary danger when others wouldn’t have despite those circumstances. The main story though and bits that kept me really turning those pages was Odette. Helen is such a great writer, she really invoked feeling when I was reading. I felt all possible emotions when I went through the story and I would really love another book on Odette’s story after everything that happened. I feel like I’m invested in her, I want to see if she does get a happy ending. I really would recommend After Leaving The Village. It’s an amazing and thrilling read that keeps you holding on to hope. Thank you Helen for allowing me the honour of reading your amazing book.